The Pronto series by Forno Venetzia offers an authentic Italian wood-fired pizza experience in a compact and portable footprint. 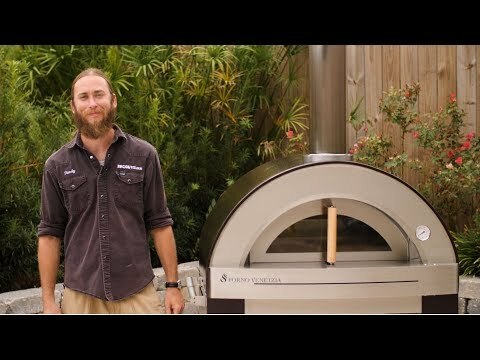 The Italian-designed and engineered Pronto 300 freestanding wood-fired pizza oven is the ideal solution for outdoor kitchens with limited space. The 24 x 20-inch cooking surface allows you to cook two personal-sized pizzas at once. The fire brick hearth is lined with double-layered ceramic insulation for excellent heat-retention and superior cooking performance. The oven dome features a durable, UV-resistant powder coat finish to help prevent color fading year-round and is complemented by a signature Forno Venetzia chimney cap and oak oven door handle. A thermometer built into the oven face lets you keep track of internal oven temperatures, making it easier to learn how to adjust cooking temperatures using the oven door. The included cart has a durable powder-coated finish in black and features an oak handle and two wheels for portability, as well as hooks for storing the included portable wood carry holder. This Pronto 300 pizza oven has a red dome finish and is shipped with a fully assembled oven unit, requiring no curing before use. Some cart assembly is required. Cooking Grid Dimensions 24 X 20"